For the congee, peel and finely slice the ginger and then roughly chop one of the spring onions into 4-5cm lengths. Do not wash the rice, instead massage 1-2 tablespoons of vegetable oil into the rice grains, so that the oil seems to wrap around the rice. Allow the rice to sit in a saucepan, soaking in the oil, for 30 minutes to 1 hour. While the rice is soaking, prepare your choice of condiments in separate bowls. If making ‘The Soy Sauce’, combine 6 tablespoons of light soy sauce, 3 tablespoons hot water, and a teaspoon of sugar in a ramekin. Finely slice your birdseye chilli then stir this through the rest of the mixture, making sure to dissolve the sugar, before setting the ramekin aside. When the rice is fully soaked in the saucepan, add the salt, white pepper, chicken stock and water to the pan, along with the sliced ginger and the roughly chopped spring onion. Place the saucepan on a high heat and bring to boil. Once boiling, turn the heat down to the lowest possible setting; then whilst simmering, cover with a lid. Simmer for 1 ½ hours, then remove the lid and continue simmering until it the congee has started to thicken. At this point, you can serve it as is, or continue boiling until the congee has reached your desired thickness, stirring occasionally so as not to stick at the bottom of the pan. Jeremy’s personal preference in terms of thickness is to keep it boiling until it has reached a ‘light oatmeal porridge’ texture. You’re ready to serve! 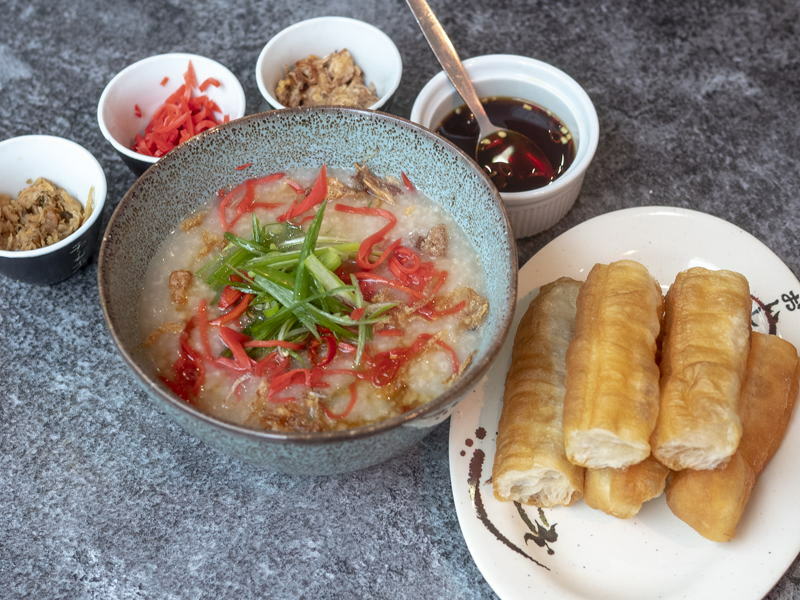 Portion the congee into bowls, and serve with your choice of condiments on the side - we love to eat it by dipping the Chinese savoury doughnut right into the congee mixture.